WALT ~ a short film created by Thom Anthony & Nicklaus Reichel (score by B¢G) is in the Wisconsin Film Fest this month!! The film received a shout out in the Isthmus! At least two of the festival’s many short films were scored by Madison-based musicians. Cellist Pat Reinholz says he processed cello sounds, among other things, through electronic effects to make the music for Just Breathe. “I used many long sounds to try to give the idea of frozen moments,” Reinholz reports in an email. Brian Grimm likewise harnessed cello and digital effects for Walt, which was shot in Madison. Grimm and Reinholz play in jazz sextet the Lovely Socialite Mrs. Thomas W. Phipps. Tuesday 4/5, 6-9pm Watercourse Trio w/ special guest DB Pedersen! Ladies and Gents, we are proud and supremely excited to have DB Pedersen join us at Dobra this Thursday ~ he is an extraordinary performer, using his entire body to produce every note. Through bansuri flute, harmonium, throat singing, vox foley, movement, and all things avant garde; DB’s hypersensitivity, inteligent sensibitlities, and quick-witted ear for improvisation will blow you away ~ We can’t wait have his presence fill the tea room! Catch DB Pedersen at Dobra Tea 6-9pm Thursday 4/5 with Watercourse Trio! Thank you all so much for supporting Lovely Socialite’s new album Registers Her Delight! Friday night’s release show was incredibly fun because of all you beautiful people! Thank you William Z. 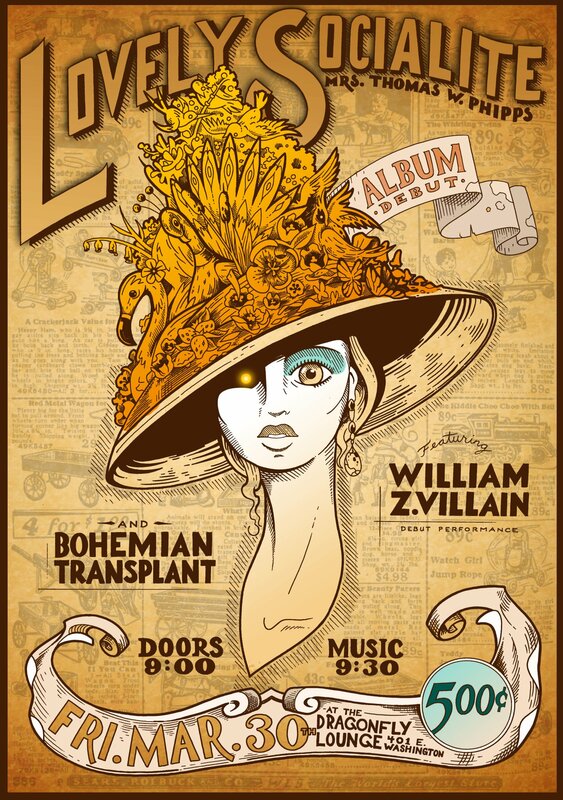 Villain, Bohemian Transplant, Dragonfly Lounge, Joshua Newland, Kickstarter Supporters, and all those who attended Lovely Socialites CD release party!! We had a blast!